Open any 'house and home' magazine and you are bound to see a picturesque display of purposely positioned and perfectly selected household items. Often the simplicity and lack of clutter alone can make a room seem vibrant and spacious. But all it takes is a single wire protruding from behind the television set to completely disrupt your picture perfect living room layout. It's not always easy to hide those unwanted eyesores. But this guide will show you some clever DIY ideas that might just help make your home a little bit more livable. Ever tripped over your dog's bowl only to spew the food all over the kitchen floor? 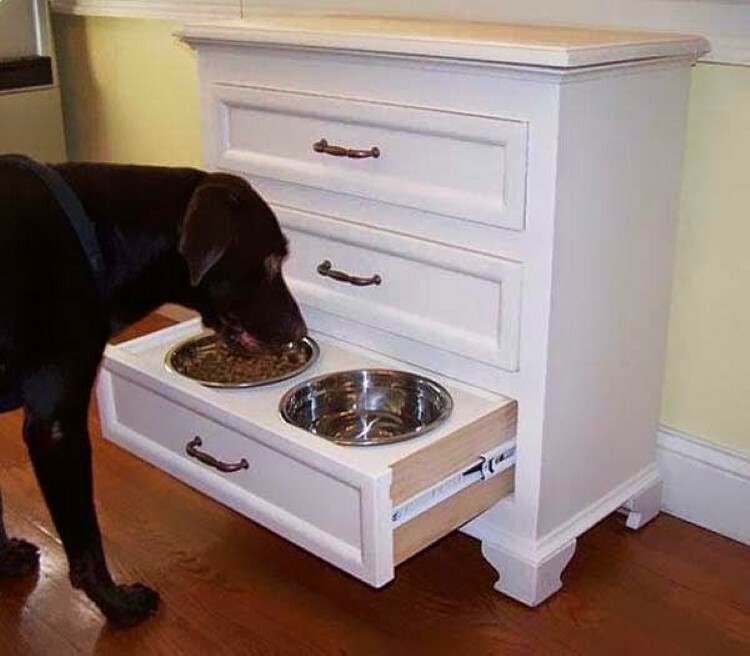 me neither, but with this doggy-bowl drawer, you can easily stow away the dog food in a neat and easy to use food drawer. All it takes to get this luxury is to modify a dresser by fitting a sheet of plywood, with cutouts for the bowls, in the lowest drawer of the dresser. When not in use, simply close the drawer and the bowls are out of the way. The only thing left to do is to teach Daisy how to open it. Aircon units can be really nasty on the eyes. So why not cover them up when not in use. 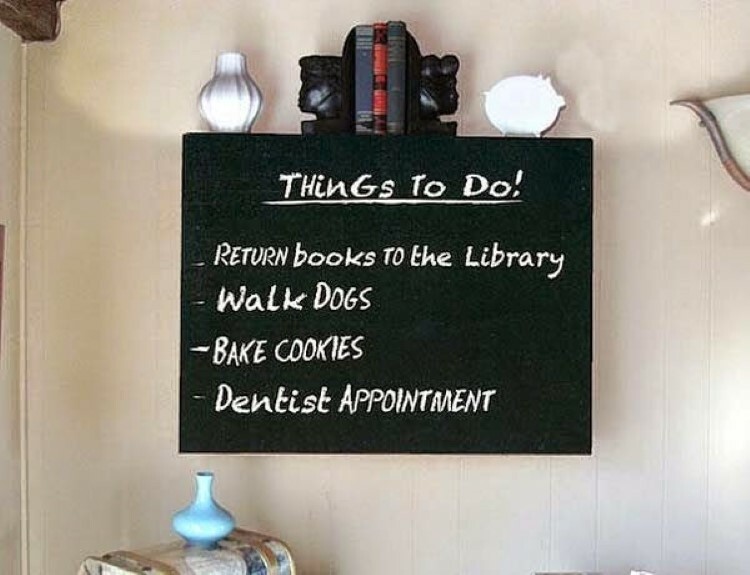 One way, as in the image below, is to place a chalkboard over the unit. Making it a practical and functional addition to the room. Another way is to simply hang a painting over it. Out of sight, out of mind. Some things can't be covered up. Like plug points and leads. So why not 'Beautify' the un-coverable by adding these bird and leave stickers for a 'greener' look. These cutouts can even be made at home and don't have to be limited to items from nature. Find an image you like online, print it and use it as a stencil over some funky colored cardboard. Then use double sided tape or cable ties to secure it in place. Sometimes it's easier just to throw a sheet of material over the cables. 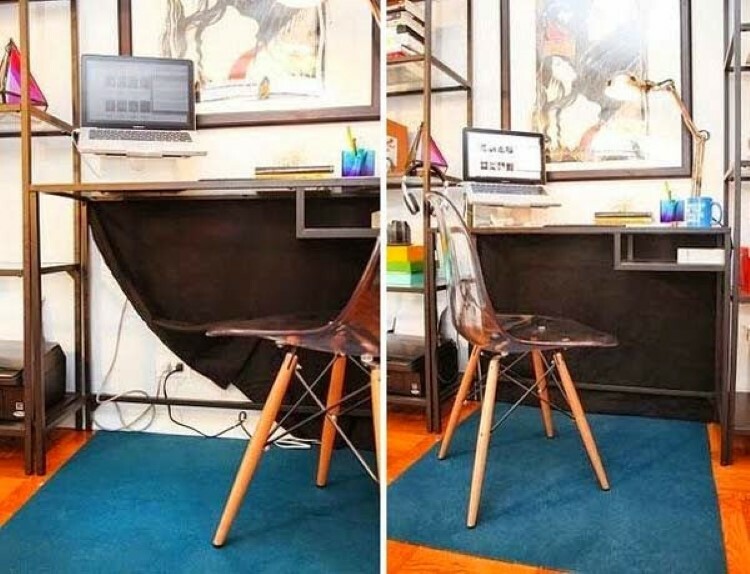 In this case hanging a sheet like a curtain from a work desk can cover up all electrical cabling that runs down the back, giving it a clean look. But make sure to pick a color that matches the wall behind or it might seem out of place. As an Engineer or Sound Technician, you probably have loads of cables hanging loose or even crammed into your man drawer somewhere. But here's an idea, let your hair down, and by hair I mean the very cables that you try and hide. 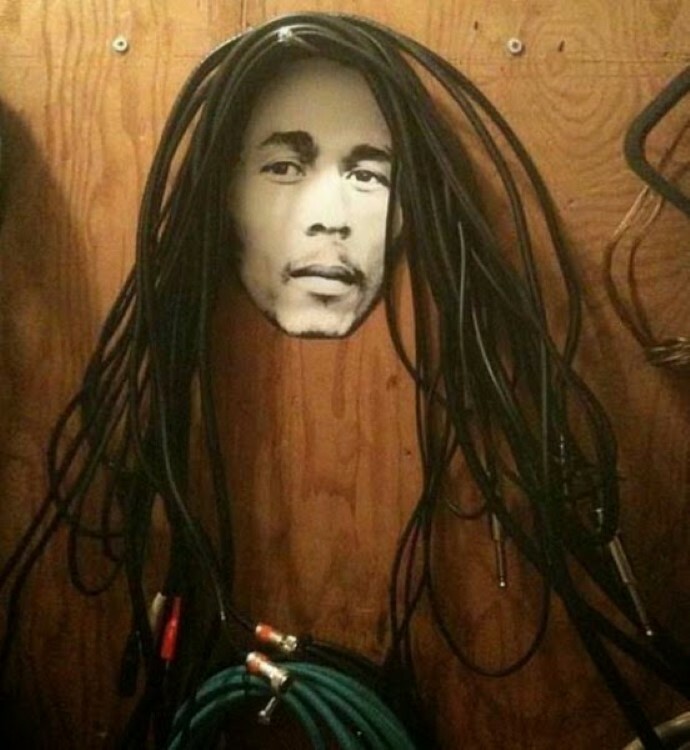 By placing a picture of Bob Marley's face below the cables, it appears as though the image has the famous singers hairdo. Ok, so this one isn't so practical, but it's a talking point. The next DIY suggestion can be used for work desks, bedside tables and anywhere that one might be charging a device where a drawer is readily available. 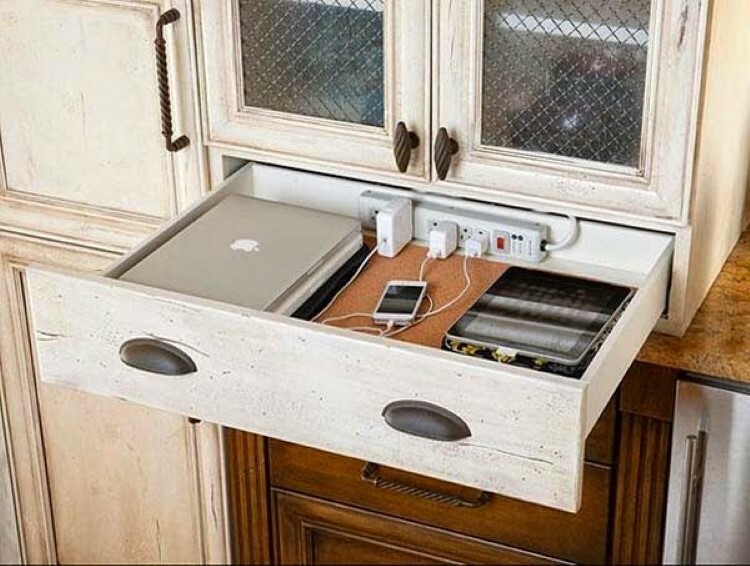 As drawers seem to be a trend here, this one involves fixing a power extension outlet to the inside of a drawer. That way, when the drawer is closed, the outlet, along with the electronic device that is charging, is hidden away to charge in peace. It also means you won't forget where you placed your phone. This could go either way. It all depends on your natural crafting ability. If your washing machine doesn't suit your art decor kitchen, why not spruce it up with, erm... electrical tape? 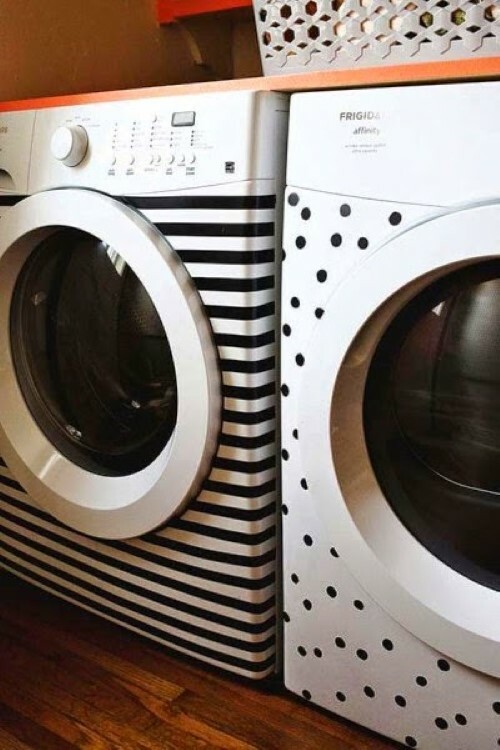 Use decals or tape to visually improve your washing machine by adding patterns to it. Using decals means that if your design doesn't come out as planned, you can always change it. Getting bored of the current design? Switch it up with something new. This one isn't permanent. This DIY hack is similar to the washing machine revamp, but a little more flamboyant. 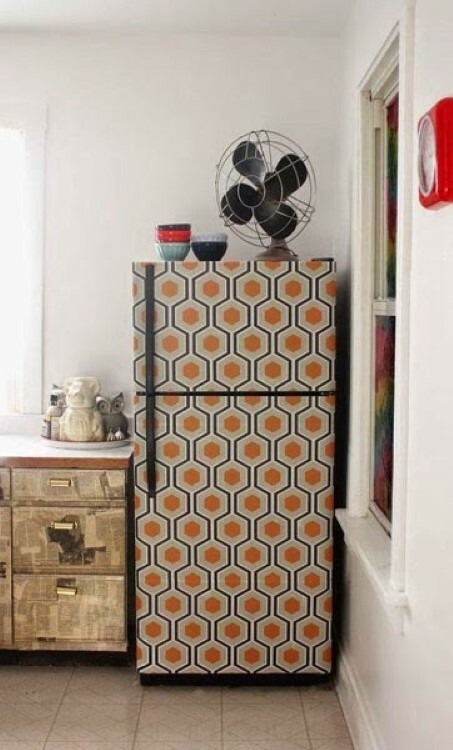 Use your leftover wallpaper to cover your fridge, thereby matching the style to your kitchen. Granted this is not the easiest modifications one could do, as anyone who has used wallpaper will tell you, but it is one of the prettiest. Just make sure to remove the handles first or you will have to cut holes in the wallpaper. While you are at it, use your leftover wallpaper to cover up bland areas in the home, such as a staircase or headboards. 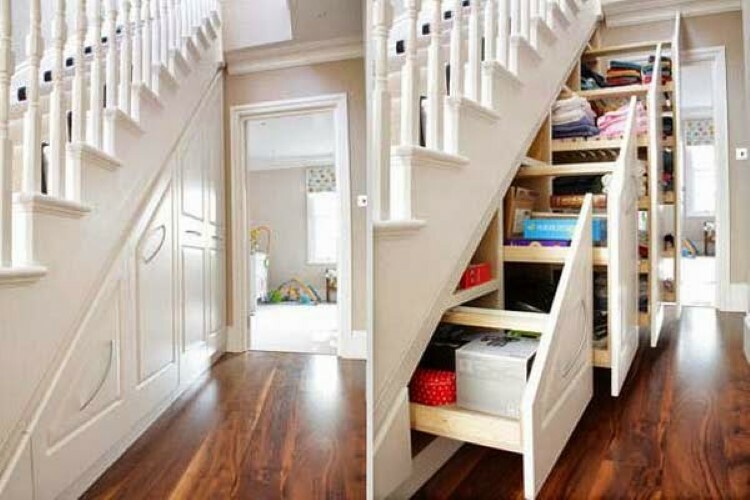 Many homes make use of the areas under the staircase as storage compartments. But it's often in the form of a cupboard below the stairs. 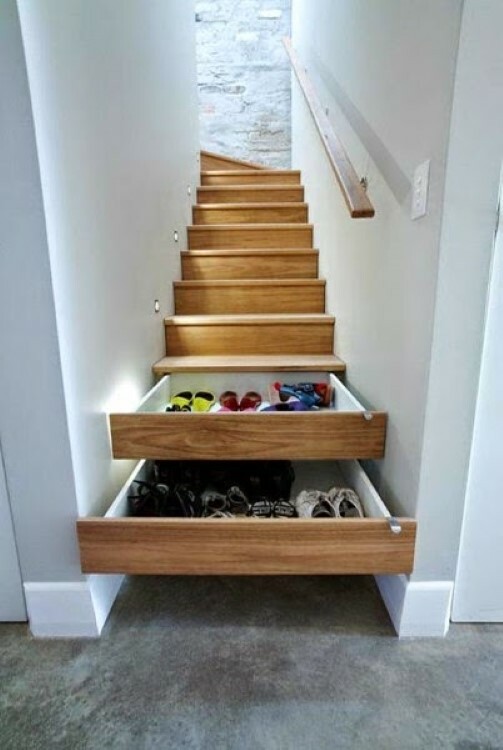 This idea takes a bit of redesign and requires installing drawers at each step. The drawers can then be used to store smaller items like blankets or shoes. Now there's no need to run all the way down the stairs to fetch slippers. Keeping with the staircase theme, if the drawer option isn't for you, try the staircase storage 2.0. This option is slightly easier to implement and it makes use of the area beneath the stairs. 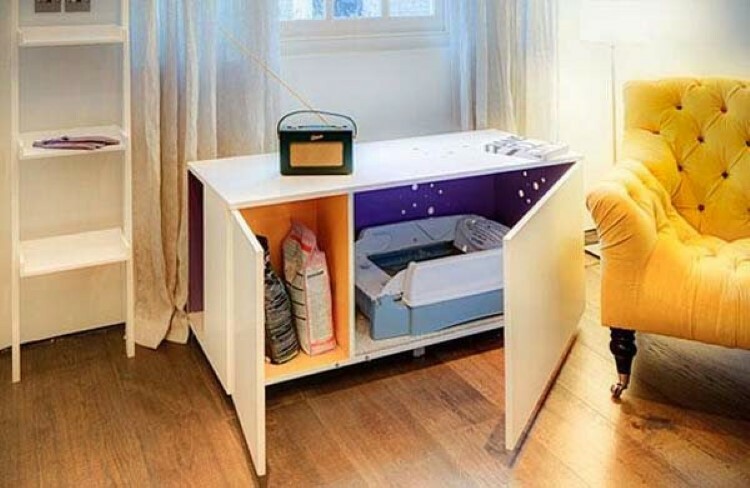 These compartments can be pulled out from under the stairs like large drawers. This lets you reach the items all the way in the back. 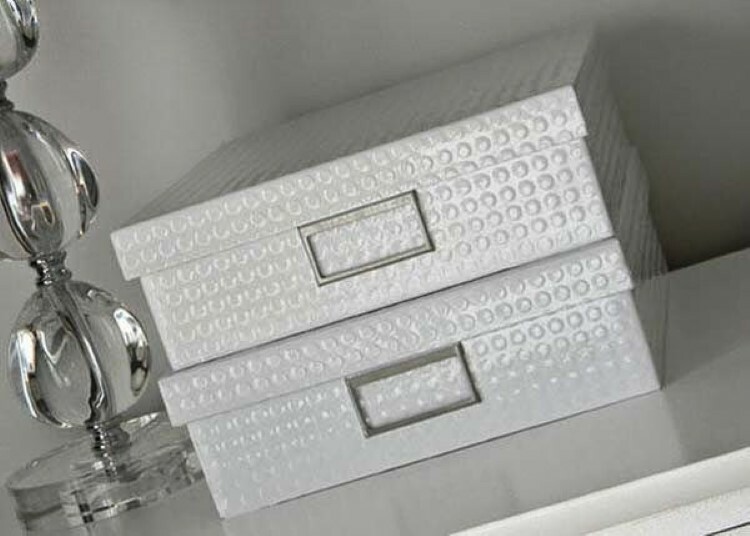 It also keeps everything organized unlike a conventional storage area. This one's difficulty level is a 1/10 yet its impact is about an 8/10, so it's well worth it. The router and accompanying network cables always look like 'spaghetti Aglio e Olio'. But they have to be there because we literally can't live without WiFi (and the network cable is too short to move it anywhere else). So take a decorative box large enough to fit the router, cut holes in the back for the cables and place the router inside. Voila! Make sure the box isn't lined with a foil or this may weaken the signal strength. 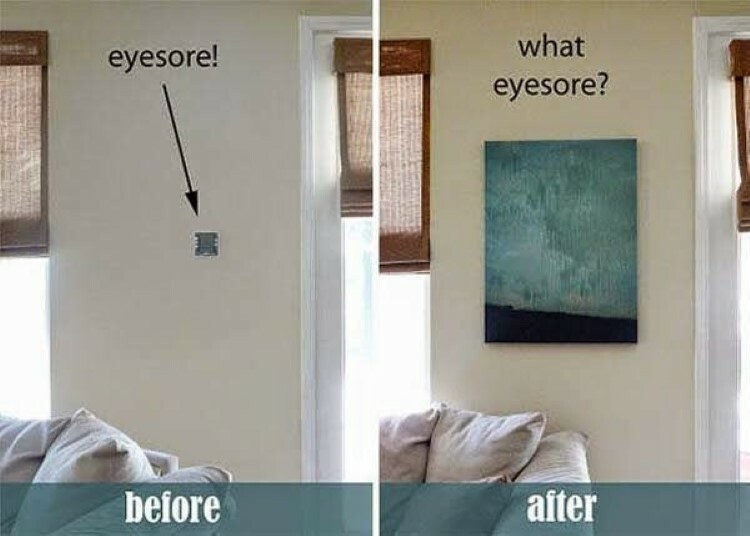 Hide dials, thermostats, electrical sockets and anything else that is at eye level and isn't visually pleasing by hanging a picture frame or painting over it. It's a really simple one but makes a huge difference to the room. Now, where did I hide that thermostat again? 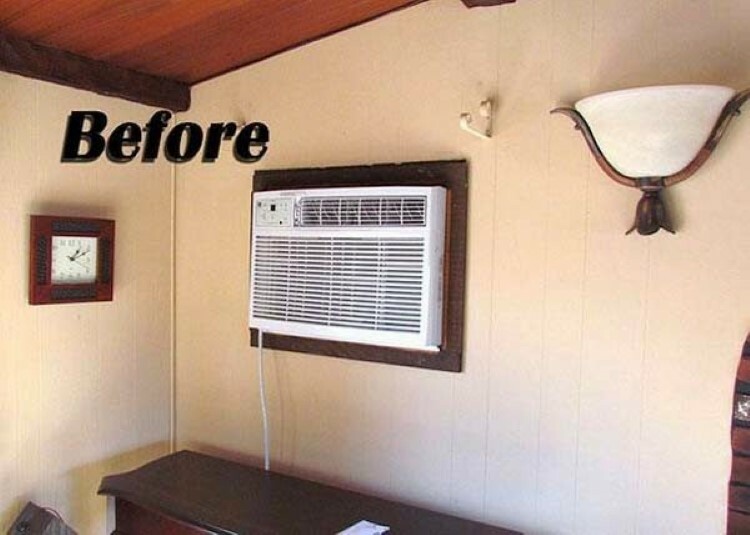 Similar to the air conditioner hack, this one involves covering a television set with a painting when not in use. This does mean you have to remove it everytime you want to watch TV, which might be a bit cumbersome. 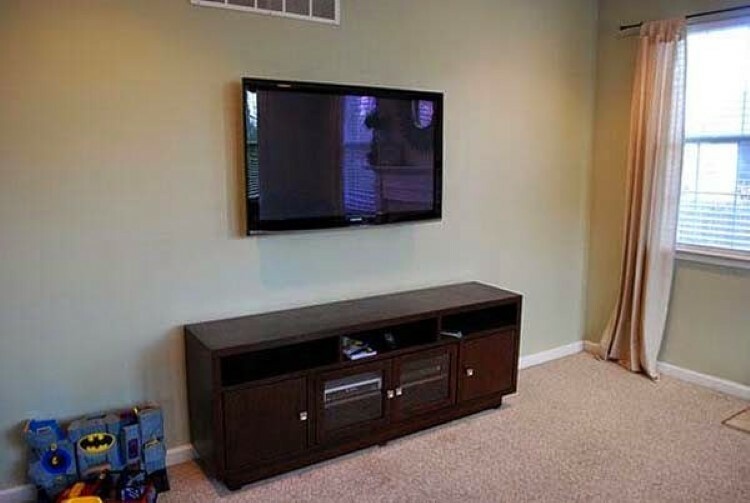 That's why I have a better solution, get a two-way mirror that fits in a frame slightly larger than the dimensions of the TV set, mount that over the TV and when not in use the TV as a mirror. When turned on, the TV display will shine through the mirror. No need to remove any painting. Fiberglass bathtubs aren't the most attractive features in a house unless they are of the free-standing variety and positioned in front of a floor to ceiling window looking out over a sea view. But for those who don't have the luxury, a major improvement could be to add cladding to the exterior of the tub. 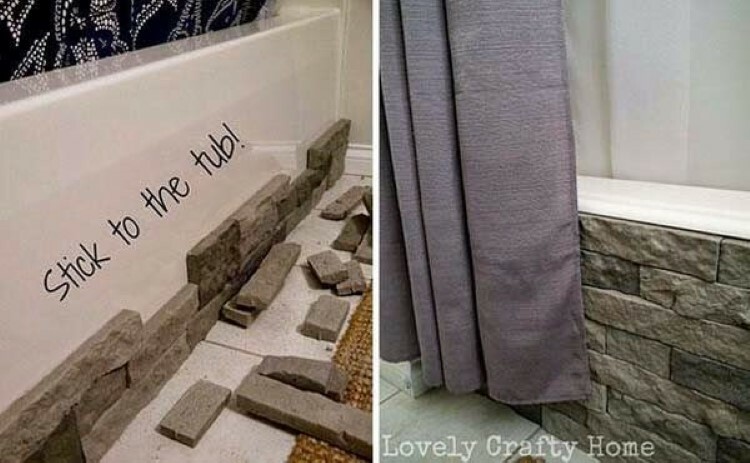 Not only does it look nice, but it gives the bathroom a 'natural stone' feel. As the title doesn't suggest, the paintings themselves aren't fake, but rather they contain a hidden compartment. Granting them a second purpose. Often people use fake stones to hide keys or fake books to hide jewelry in a bookshelf. 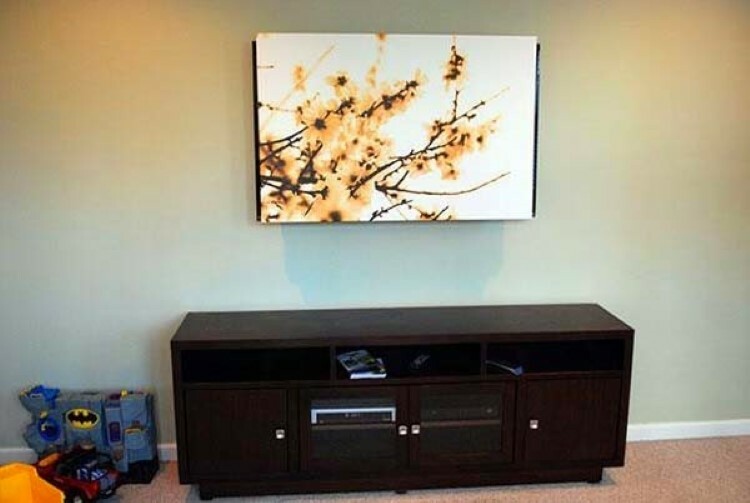 Here is another idea, hide your valuables behind a flip down painting. Hanging there very unassumingly, no one would think to open up a painting to find stashed away valuables. So it's the perfect spot. Construct a wooden frame that mounts on the wall and fix a hinge bracket to the painting. Attach hooks on the backboard to hang your items. The idea of picket fences are always serene and remind us of a cottage on the prairie. So why not incorporate them to your home? 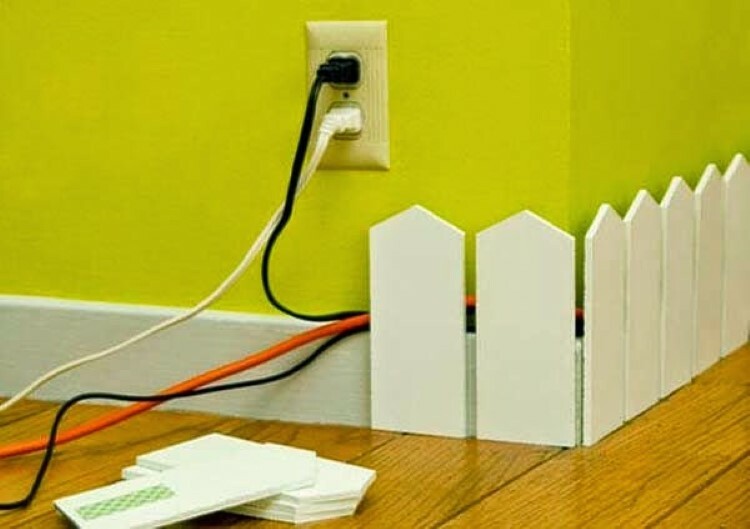 This playful idea entails sticking miniature picket fence panels along the skirting of the floor to secure and cover any cabling that might be running along the wall. Cables are usually secured by plastic brackets that are nailed into the skirting, but the wires are still visible. This method hides those wires in a funky way. Workplace clutter can really get you down. To add to it, your desk is riddled with loose wires. 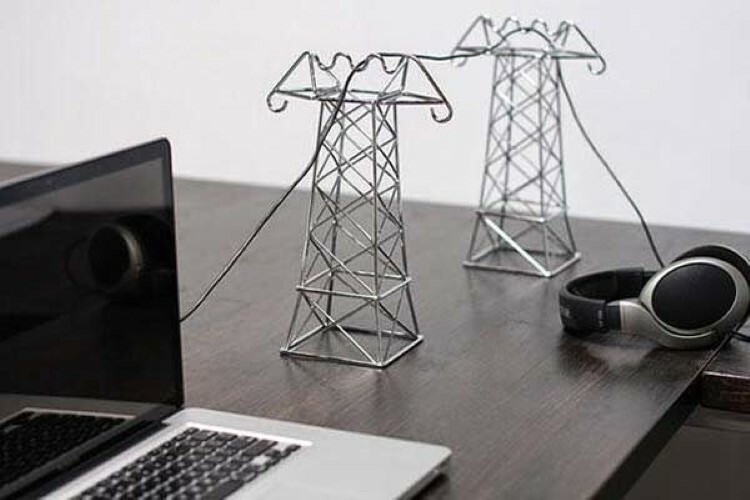 One fix is to go wireless, another is to use miniature transmission towers to hold loose cables that are spread all over your work space. 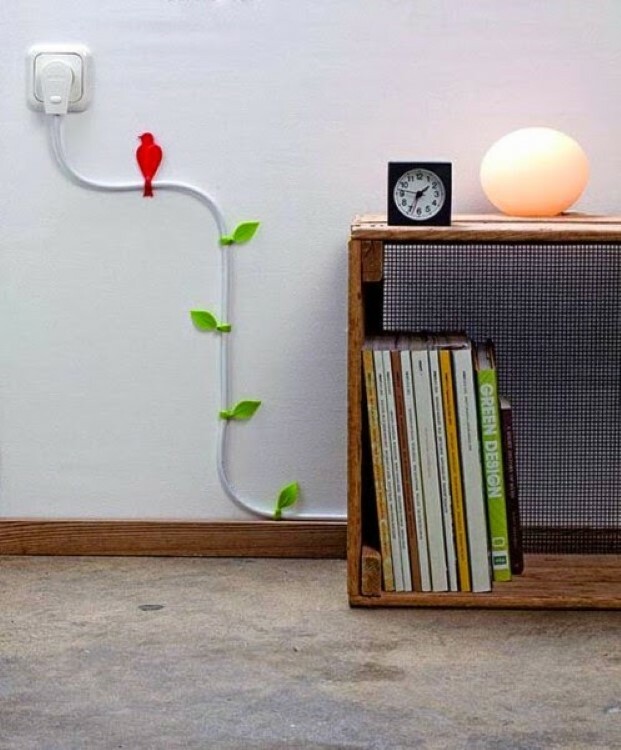 This cool addition to your workplace not only organizes your wires but adds an element of power (see what I did there?). It's a must have for any engineer. This one is not so much an innovation as it is practical and should be used by anyone who has a cat. Much like the dog bowl, a cat litter tray becomes a sure obstacle in the dark and often ends off by having to rinse your slippers. So avoid the midnight fumble by storing the cat litter tray inside a cupboard that has a cat entry. This also prevents children from playing in the cat's 'sand pit'. Garden and Home shops usually sell large fiberglass bolder look-alikes that are used to cover things such as pool motors, pond pumps, compost reservoirs, etc. These faux boulders are a great way to hide ugly garden features that can't be removed such as water meters and drain outlets. The boulder keeps the garden's natural look while covering up the unwanted. Another WIFI router hiding place, except this one is a little more hipster. 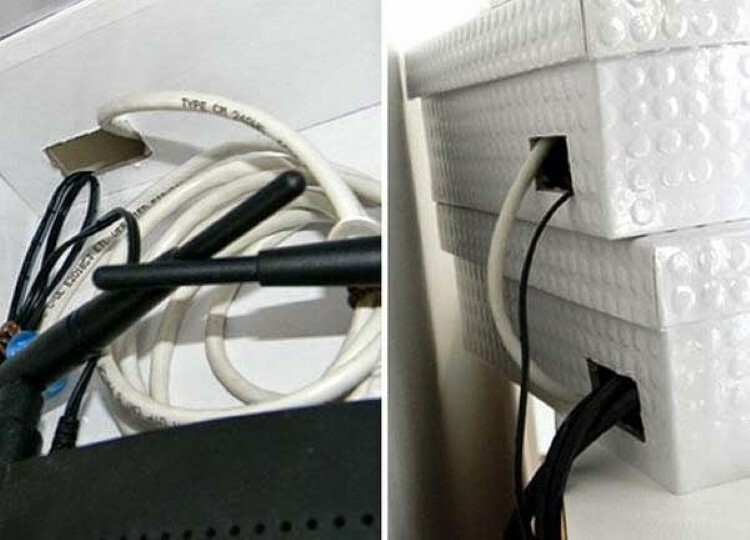 Use an old book cover, with the pages removed, as a storage space for your router. 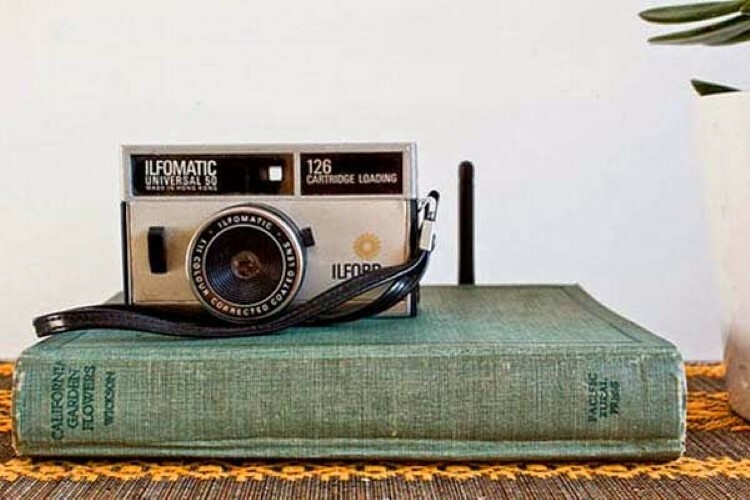 Let your guests think you are a little more sophisticated than you actually are by adding a retro camera to hold down the cover. There is no easy way to store shoes. It's either in a large pile at the bottom of a cupboard or in some sort of shoe rack that can only fit one shoe out of each pair. Here's an alternative, and quite a nifty approach. It works like a bookshelf so you can use as many as needed all the way up the wall. The lower shelf supports the shoe, while the upper thinner shelf, prevents the shoe from falling backwards. Now you could just make a shelf large enough to fit the full shoe, but what would be the point of that? This design saves cupboard space and looks neat. Anyone who has a desk chair in their room knows what it's really used for. 90 percent of the time a chair in the room is used for hanging your clothes, either while you search for the right thing to wear, or just until you decide to rehang your items. The other 10 percent is split between using it as a stepladder to reach items at the top of the cupboard and to sit at your desk for work. So instead of using an entire chair as a clothes rack, why not cut it in half and attach it to the wall. This way you get the same features, at half the space. This storage idea is a really cool way of keeping your kid's Lego pieces off the floor so midnight accidents don't happen. Nothing beats the pain of a barefoot encounter with Lego. All that is required is a large pickle jar and some white and black paint or a sharpie pen. Paint the entire jar yellow to make it look like the head of a Lego man. Then draw on the eyes and mouth using the sharpie. The head can now be used to store Lego pieces. Lego-ception! 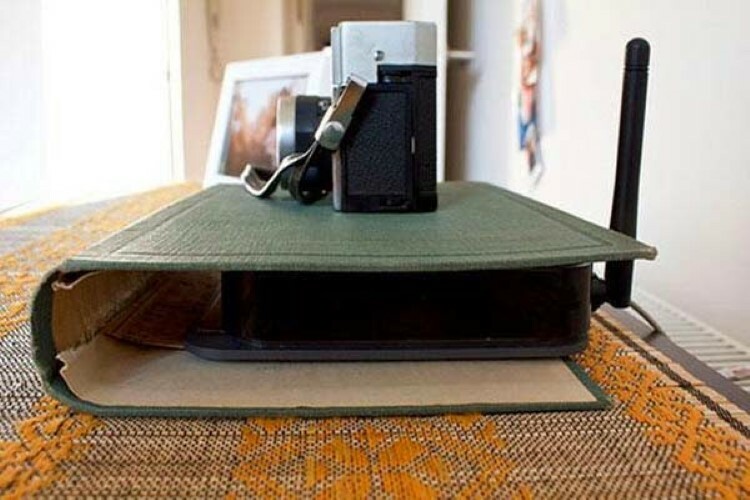 Here's an elegant way to store newspapers and magazines. The stand is made up of copper plumbing pipes and wooden dowel sticks. The copper connectors are used to attach the wooden rods together (can be cut from an old broomstick). The wood and copper mix adds a rustic yet elegant look to your sitting area. Head to Table and Hearth to find the full build guide.